Animal enrichment is the process of providing a stimulating environment for your pet. Enrichment is described as improving or enhancing the environment to provide an outlet for natural behaviors and needs through physical and mental challenges. These types of enrichment are used by zoos, sanctuaries, and pet owners worldwide. Enrichment is essential to a healthy and happy pet. You are likely already providing enrichment every day to your pig without realizing it. 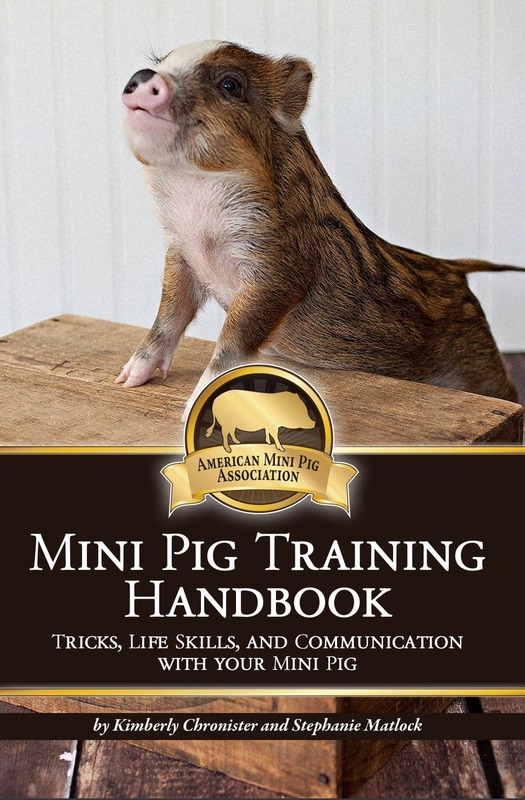 By understanding pig’s natural behaviors you can create activities for him to enrich his life and meet his needs. Pigs are incredibly sensitive and intelligent animals. This high level of intelligence can be challenging in a home environment. Pigs require physical and mental stimulation to meet their needs. A busy pig is a happy pig! 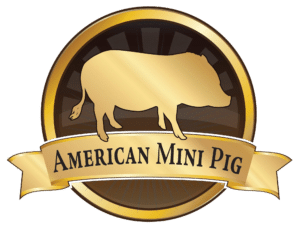 Keeping a pig contained to a crate or alone in a room all day with no companionship or stimulation is sure to create a bored, agitated, destructive, and possibly aggressive pig. 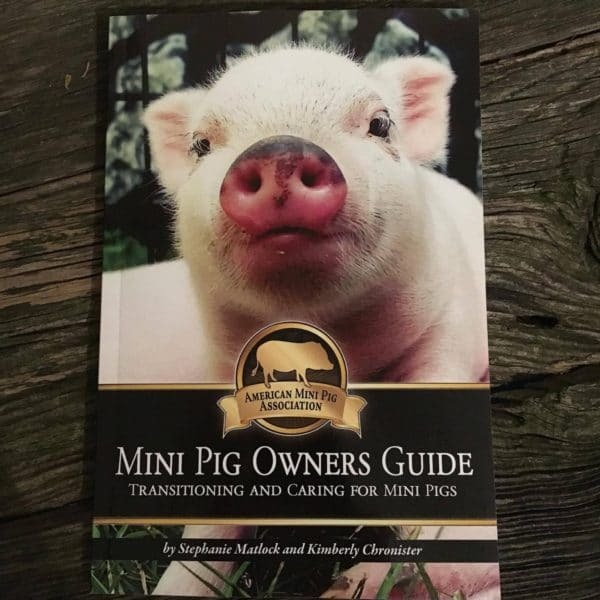 By using activities to enrich their lives (with or without you) you can avoid many unhealthy behaviors while building a better bond with your pig. Enrichment helps to provide the life your pig deserves. Enrichment activities offer an outlet for natural behaviors. Daily routines are the perfect opportunity for enrichment. Instead of feeding in a bowl, pig feed can be sprinkled throughout the yard for foraging. Instead of giving vitamins/supplements, the pig can do a few tricks and then rewarded with the vitamins. Enrichment is open ended fun. Get creative, get interactive, have fun! Enrichment activities should be interesting, challenging, and novel. Enrichment should be used every day with your pig, although the complexity will vary. This is one area routine is not preferred. Switch it up, keep it interesting, and always challenging. Types of enrichment may include physical exercise, mental exercise, training or interactions with the human family, olfactory using scents, auditory using sounds, food related, novel objects, exploring new environments or manipulating the home environment. See our Pinterest board of enrichment activities by clicking here. Treat Balls or dispensers: Treat balls come in many shapes, sizes, varied difficulty, and different movements. Some are made for pigs while others are made for dogs, cats, or horses. The different toys will work similar in that the pig uses her natural rooting/nudging behaviors and is rewarded with a snack. All sorts of foods can go into these balls. 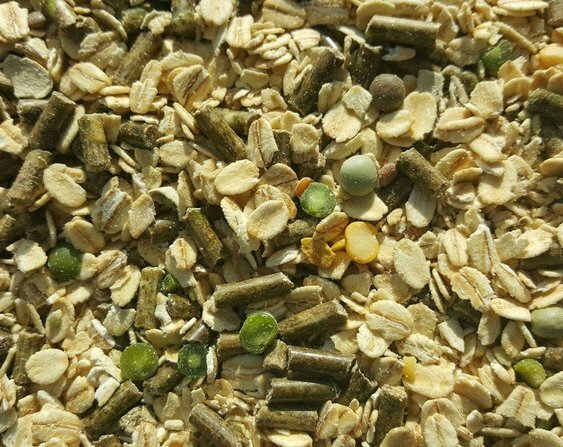 Depending on the individual ball you can use the pigs normal feed pellets, black oil sunflower seeds, cranberries, oatmeal, other natural whole grains, popcorn, cheerios, puffed rice cereal, other seeds, any unsalted nuts, or healthy low sugar whole-grain cereals. Homemade treat dispensers: You can use any type of bottle, small water bottle, big two liter bottle, an empty oatmeal canister. Any container safe for food or drinks is fine. You can either leave the cap or lid off or cut, punch or drill holes the size you want. Remember, the bigger the holes the more versatile it will be with different foods but the faster the food will come out! Less holes will be more challenging giving the pig more exercise and stimulation. Yogurt tubs, margarine tubs, juice bottles, and Pringle’s cans with holes have also made great homemade piggy treat containers. Other food balls: An open type ball is another great choice for stashing snacks. Rubber webbed balls for dogs found in pet stores or amazon make an excellent pig toy. It works great to stuff lettuce, veggies, and grass clippings. The pigs will have to work to get the food out. You can also stuff some newspaper or cloth inside, crumpled up with pellets or treats. Another option is a whiffle ball with the holes. Just tape over as many holes as you need for the desired difficulty. Sandbox or Sand pit: A sand box is a great enrichment activity for pigs. They enjoy rooting around in the soft sand. Be sure to supervise your pig to avoid eating the sand. You can hide treats like popcorn or cheerios in the sand and watch them “treasure hunt”. Pigs have a very keen sense of smell, hiding treats in the sand allows them to use that super power and satisfy their natural need to root and forage for food. Hay pile or box: Hay makes a great rooting/foraging medium. It’s soft and they enjoy digging through searching for their snacks. As they flip it around the hidden treats will shift, giving them more of a challenge. 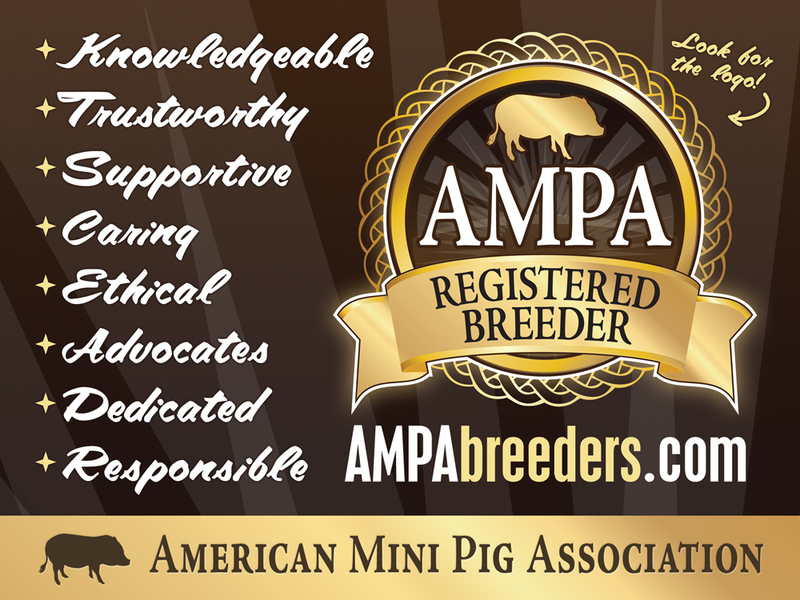 Any snack is appropriate, the pigs normal feed pellets, black oil sunflower seeds, cranberries, oatmeal, other natural whole grains, popcorn, cheerios, puffed rice cereal, other seeds, any unsalted nuts, or healthy low sugar whole-grain cereals. Rooting Box: This is a great indoor activity. Just like with sand and hay, a rooting box gives the pig a place to root while satisfying her natural foraging and searching needs. Appropriate items for a rooting box are ANYTHING safe, big enough to not swallow, not sharp, ect. 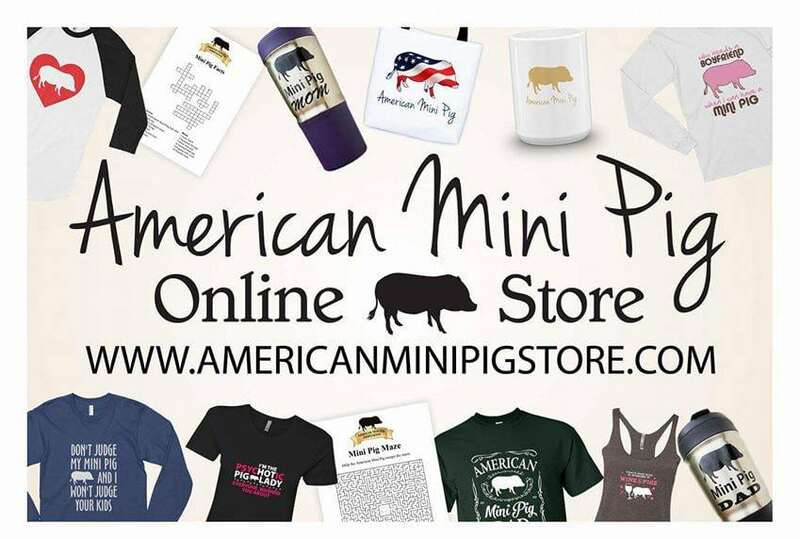 Many use play pit balls, river rocks, large stones, stuffed animals, an assortment of toys, blankets, newspaper, anything your pig can search through will work fine. For the box itself, it can be an actual wooden frame, a plastic tub (if pig has trouble with traction put sandpaper for traction and hoof care on the bottom or a rubber suction cup mat made for bathtubs), small kiddy pools work great, some people put the rooting objects into a dog crate to keep things contained. Use your imagination! 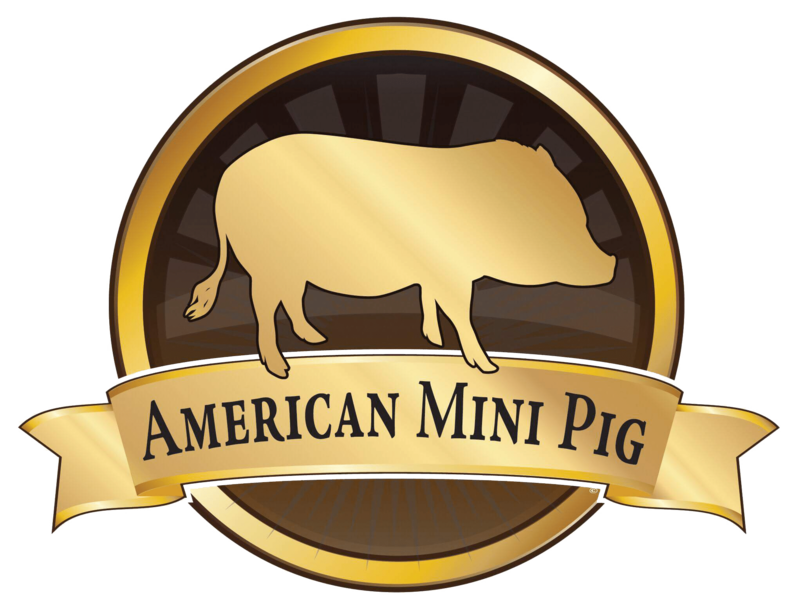 Again, an assortment of options for the reward, the pig’s normal feed pellets, black oil sunflower seeds, cranberries, oatmeal, other natural whole grains, popcorn, cheerios, puffed rice cereal, other seeds, any unsalted nuts, other healthy low sugar whole grain-cereals. Tied Towel or Fabric: These can be tied in a variety of ways. Treats can be hidden in a loosely tied piece of fabric or towel. Alternatively, dab some coconut oil on a fabric or towel tied in knots. Hanging Treats: Can be hung from the ceiling or the top of a crate. By hanging an enrichment toy you increase the difficulty level giving the more satisfaction, more time to be busy, and more of a mental and physical workout. This can be accomplished with the rubber “webbed” dog balls that you can stuff veggies, lettuce, grass, or hay into. You can also put a hole through a water bottle to tie it up, put a few treats in the bottom and piggy has to nudge the bottle to flip it up for the treats to drop out. Large pieces of fruits or vegetables can be strung up and hung, such as watermelon or pumpkin. Water can be mixed with fruits, vegetables, or juice and frozen into a block or ring that can hang providing much needed cooling relief and enrichment during the summer months. Cardboard Box: Most pigs enjoy the searching through a cardboard box. Fill it with hay outside or crumpled paper inside. Frozen Swing: Using a large bowl, fill halfway with water; add a few pieces of fruit or veggies. To make an ice ring, place a glass in the center (to create the hole). Place in the freezer overnight. Once frozen, run under warm water to loosen the ice from the mold. Ice ring can be hung from a branch; ice blocks can be placed on the ground or in a kiddy pool. Food Hide: Hiding food gives the pigs an opportunity to use their natural abilities to forage, an excellent mental and physical workout. This can be done with their normal pig pellets, fruits, vegetables, or treats. They thoroughly enjoy searching around for their food. Hide bits of food around the yard or under rocks or stones (paving stones and flagstones work well). You can also hide food around the house and watch them hunt it out. A fun idea is to cut up their lunch salad & take it into the yard alone. Throw a few pieces in plain sight. Then hide the rest. Put a tomato under a bucket. A cucumber piece in the chair. A pumpkin chunk behind a planter. Set some eggplant on the bench. Sprinkle some lettuce near the fence line. Make it a challenge and the pig will appreciate it that much more. Scents: Pigs have an incredible sense of smell. They use this sense of smell to explore their environment. You can use this to provide enrichment to your pig by using smells or scents as mental stimulation. Only use a very small amount of product so your pig doesn’t try to ingest it. Perfume, lotion, spice pates, or essential oils are popular choices for scent enrichment. These scents can be sprayed or smeared on items that are too large to be ingested: toys, flooring, stones, pavement, fence posts, trees, bushes, or various areas of the yard. Toys: Some pigs enjoy stuff animal toys, crinkly toys, squeaky toys, or infant toys that make sounds. Treat Jugs: 5 gallon water jugs make excellent enrichment. Drill holes along the sides, fill with old fashioned oats, and water the pig roll it around the yard. An excellent workout with minimal calories. Alternately, juice bottles or peanut butter jars can be used. Tube Dispenser: Cut a section of PVC pipe with cap ends. Drill holes throughout the pipe. Treats can be added inside the pipe. Then, the pig can roll the pipe around the yard OR it can be mounted to a frame to keep it in place, either indoors or outdoors. As the pig roots at the pvc pipe, it will rotate allowing the treats to drop through the holes. Start with minimum holes and increase holes as necessary to accommodate the challenge level your pig desires. Mud: Summer is the perfect time to flood a mud hole in the yard. Use the hose to drench several inches of water in a low area. The pigs will root, roll, and wallow. They will use this water and mud to cool off and protect their skin from sun and insects. Plastic Crates: Crates with holes already in them such as plastic milk crates can work as a puzzle for larger pigs. Tie two crates together with lettuce or other snacks inside. This will create a challenge for the pig and he will get more enjoyment out of his salad. 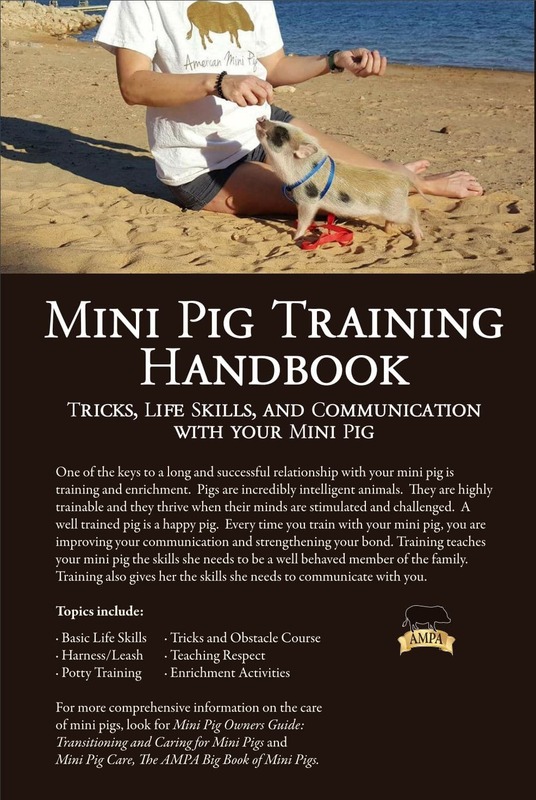 Trick or Command Training: A great way to bond with your pig while letting her use her brain and earn rewards. Training also reinforces herd hierarchy and builds trust. Sit, stay, bow, crawl, kiss, wave, shake, run through tunnel, run through weave poles, circle 8 between mom’s legs, run a circle around mom, back up, come, spin, reverse spin, play golf, basketball, fetch, sort puzzles, roll out the red carpet, the possibilities are endless. Obstacles courses area great fun! Can be purchased for cheap or repurposed from common items around the house. Kiddy Pool: Pools are GREAT! Inflatable pools or hard plastic pools work unless your pig is a destructor. Many vegetables will float in the water. 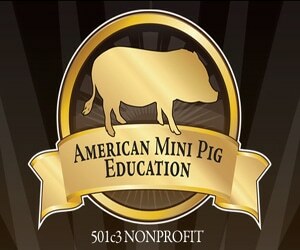 This is a great way to introduce your pig to the pool and make it rewarding. A pig can enjoy her pool in many ways, cooling off, splashing, flopping, having a floating salad, etc. If your pig is particularly fond of the water you can even SINK treats and she will snorkel around the bottom of the pool!! I find pigs like traction, so the inflatable pools work great for that. If you have a hard plastic pool your pig hesitates to enter, try using a rubber bathmat with suction cups. It’ll give her peace of mind and make her adventures more adventurous. Snacks in the pool are a great way to cool off, hydrate by drinking more water, and make that lunchtime salad last a big longer. 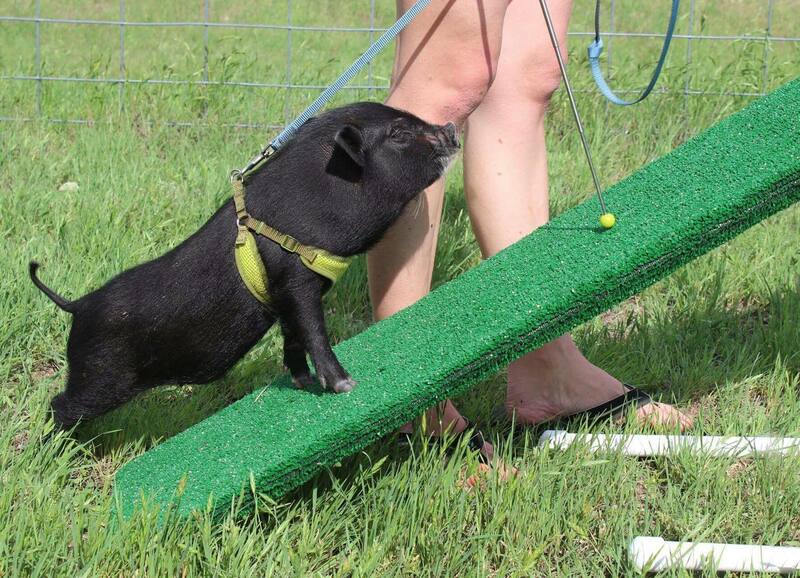 Adventures: An often overlooked form of enriching your pig’s life is to show her the world. Harness train the pig and go for a car ride. Go check out the mountains, go for a hike, mingle at Petsmart or Tractor Supply, go to the beach, play in the sand & water, check out the lake and snorkel for little bugs, play in a stream, check out a friend’s house with all different toys and smells, go camping, take a walk, visit a nursing home, meeting new people, vacationing, ride in the car to pick up the kids from school. A pig is so intelligent they really do enjoy broadening their horizons, exploring the world around us is a great mental exercise and enrichment for them. Pallet on Wall Filled with Hay: Attach a pallet to a sturdy wall and fill with hay. Hide treats inside the hay for rooting fun. Frozen Snacks: Frozen snacks are a great treat to give during the summer. They can be as low calorie as you want. They can also be used to float in the kiddie pool for extra fun. Water or juice can be frozen into bowls or Tupperware. Include a string or rope before freezing if you want to hang it. Alternatively, ice cube trays can be used for smaller treats. The following ingredients can be added for variety and nutrition: chopped fruits or vegetables, canned pumpkin, yogurt, apple sauce, or coconut oil. Puzzles: Pet puzzles, usually designed for dogs, are another great fun toy. Hanging watermelon: Watermelon is an excellent treat in the summer. It is nutritious and hydrating. A large piece of watermelon can be hung from a tree branch. This will be challenging for your pig as the melon moves freely. Scratcher: A rigid brush can be attacked to the side of a building, wall, or fence to offer a scratching spot for your pig. Bowling Ball, Soccer Ball, or 5 gallon bucket: Some pigs love to push a ball or bucket all over the yard. Horse Toys: An assortment of toys would be appropriate for a pig. Look at your local feed store or tractor supply to shop enrichment toys they have for horses. Amazing Graze is an excellent choice for rolling around the yard. Toddler toys: Many toddler toys are great fun for pigs. Some pigs love the motion toys or lights/sounds. Toys that would roll around with a nudge would be a favorite. Crinkle toys are popular with some pigs. Pianos: You can teach piggy to play piano. A toddler piano would work just great. For photos of enrichment activities and more ideas see our Pinterest board by clicking here.